Flamingo is a rare bird symbolizing the elegance, the good lucks, and the happiness. Named after this totem bird, Flamingo Cruises was built with an objective of bringing passengers joy and happiness. This is a good choice among wonderful cruises in Halong Bay offering you a graceful and memorable experiences. 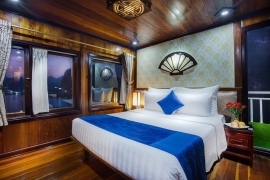 Flamingo cruise was launched in 2014 and designed following the style of Vietnamese traditional pattern. It has the dimensions of 31 meters in length, 5.8 meters in height, and 8 meters in width. It has three decks with 14 cabins in total. Cabins are classified into three types, including 8 Deluxe Cabins (on the first floor), 4 Premium Deluxe Cabins (on the second floor), and 2 Suite Cabins (on the second floor). Especially, the first and the second floor will offer one connecting door cabin. In general, cabins are spacious and well-appointed, meanwhile suites are more luxurious with large en-suite bathrooms. Cruising with Flamingo Cruise, passengers have a wonderful opportunity to experience a unique itinerary and discover the endless beauty of Halong Bay. The cruise will bring you to visit the most beautiful attractions in the Bay such as Hoa Cuong Floating Village, Soi Sim Beach, Coconut Three Island, Pearl Farm Village, and Surprising Cave. Besides, a series of thrilling activities will be included like kayaking and swimming in gorgeous area, climbing, cooking demonstration, Tai Chi session, Sun Set Party, and so forth. The shuttle bus will pick you up at your hotel around 7:30, however, please be noted that this pick-up is only applied for those using Flamingo shuttle bus. Enjoy a long but interesting drive from Hanoi to Halong Bay where you can see natural scenery of Red River Delta and visit traditional hand-made handicraft products at a stopover in Hai Duong City. The shuttle bus will arrive in Tuan Chau Island in the midday. Flamingo Cruise crew team warmly welcome you embark on board with a refreshing drink. After checking in your cabins and listening to safety instruction, this is time to wake your wake up your taste buds with a great lunch. Flamingo Cruise will pass through many beautiful attractions in Halong Bay such as Hoa Cuong Floating Village, Soi Sim Beach, and Coconut Three Island. In the mid-afternoon, the cruise will bring you to visit Pearl Farm and Titop Island. The emerald and crystal-like waters of Titov Beach make it ideal for swimming. Besides, you can climb up to the mountain to get fantastic views of Halong Bay from the high altitude. Happy Hour at 5:30pm will allow you to buy one and get one free. For those interested in Vietnamese cuisine, do not miss Cooking Class which will take place at 6:30. The cooking class will show you how to make fresh/ fried spring rolls and mix fish sauce. Later, time to enjoy Sunset Party with fruits and wine. Delicious set menu dinner will be catered at 7:30 under the beautiful night sky. Then, relax and take time to chat with other passengers or joining the squid fish with the staff. Morning: Wake up early to enjoy the magnificent beauty of Halong Bay at sunrise and participate in Tai Chi Class. Later, time to recharge for a new day with a light breakfast (tea, coffee, and bakeries included). Around 8:00, Flamingo Cruise will bring you to explore a must-see attraction in Halong Bay, Surprising Cave in one and half an hour. A farewell lunch will be catered at 10:15 with a wide selection of traditional Vietnamese dishes. At 12:00, the cruise will arrive in Tuan Chau Pier, time to say goodbye to the crew team, disembark, and wait for the shuttle bus. Afternoon: The shuttle bus will bring you back to Hanoi around 16:00. Trip ends! Peak season surcharge: Surcharge $30/person for Gala dinner applies if guests stay overnight on December 24th, December 31st and/or Lunar New Year (15 Feb 2018). Hello, We wanted to check the availability of Deluxe ocean room, on 9th -10th July. Also, do you have vegetarian options for food? Hi, I'm interested with your cruise package and i'm planning to made my ha long trip on 10th March 2018. At the final step of the booking, a 30% deposit is required, may I know if i wanted to cancel the trip before 8th Feb, can i get my deposit refund? Thank you. And may I know the free shuttle is it a bus or a van? And how many seater for the shuttle? Dear Yunseo, Thank you for your question! Kayaking is included both in the schedule and in the price too. At the moment we still have available cabins on Jan 28th for you. If you need further information please let me know! Is the $510 for 2 pers or each for the flamingo cruise 3 day 2 night? Thank you. Hi, I would like to book your cruise, but I'm not going to stay at a hotel around the Hoan Kiem lake. If I make a book, where and when do I have to wait to get your shuttle you provide. Hello, We want to book a room for 2d1n, wanted to know if meals were a part of the package as it is no where mentioned. Dear Roohi, Thank you for contacting us! I would like to confirm that all meals are included in the cruise package already. You just need to settle bills for drinks on board only! If you have any questions please let me know! Hi there. We are family of 5. Two adults and three children, aged 11, 9 and 7. Do you have adjoining cabins for a family. Also is your cruise suitable for children? Hi have you got wifi in the cruise? David was one of the most enthusiastic guides who spoke perfect English, knowledgeable and very courteous. The cabin and bed were super nice and clean. I found it spotless. The food was joyful as well. Incredible tour filled with activities for the liveliest experience of the highlights of Halong Bay. John was just an outstanding tour guide who knew everything not only about Halong but also about Vietnam. Clean and comfortable cabin. Excellent services, friendly and helpful staff. The boat was not too big but still had enough space for all people. Chefs and staff on the cruise did a great job in accommodating us as vegetarians. All the services were served smoothly and nothing seemed to be overlapped. Great welcome drinks and friendly cruise team. The food was superb. My daughter was a vegan and the meals provided for her were varied and large. The local guide was very professional and warm-hearted. He helped us to communicate with the locals who couldn’t speak English to explore more about their lives. He also gave interesting instructions about local tourist spots in the liveliest way. Services were slow, we needed to wait in the heat for a long time to check in and check out the cabin. The room was a bit small and we had to heap our luggage to create more space. It’s the greatest inconvenience. Besides, the cooking demonstration was more fun for the kids rather than adults. Most of the time I just stood and watched. The 2 night cruise was brilliant. Cabin on the boat was ample, comfortable and the food was much better than I expected. Staff were very courteous and cheerful, especially our guide, Mr. David who took us to amazing sites and gave good speech.